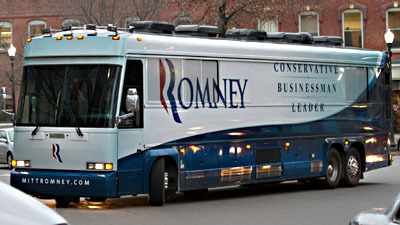 Romney’s campaign bus circled Obama’s fundraiser at Boston Symphony Hall Monday night several times, according to Romney deputy press secretary Ryan Williams and verified by several onlookers who said it was honking its horn as it passed. Williams told BuzzFeed that the bus made “a few” laps before local police closed the roads around the venue before Obama’s arrival. They plan on bringing the bus back after Obama leaves to attend another fundraiser. The fundraiser was inside the hall, the bus didn’t interrupt anyone trying to speak, it didn’t block any entrances, and it didn’t harass anyone trying to get in. As near as I can tell, the only real purpose of this was to demonstrate to Romney’s base that he holds Obama in the same contempt they do, and he’s delighted to resort to sniggering junior high school displays to prove it. Welcome to Romney 2012. Still four months to go. Why is God punishing us like this?